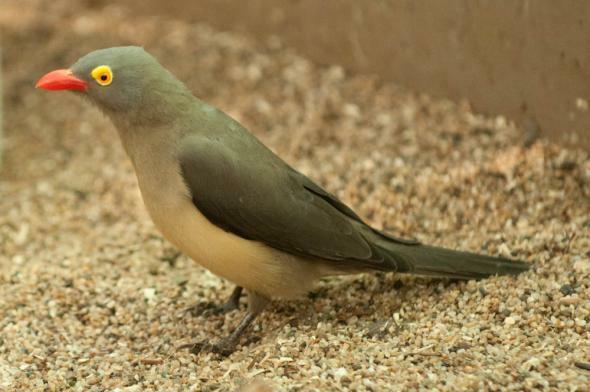 Tanagra erythrorhyncha Stanley, 1814, Ethiopia. French: Piqueboeuf а bec rouge; German: Rotschnabel- Madenhacker; Spanish: Picabuey de Pico Rojo. 7.5–8.7 in (19–22 cm); weight 1.5–2.1 oz (42–59 g). 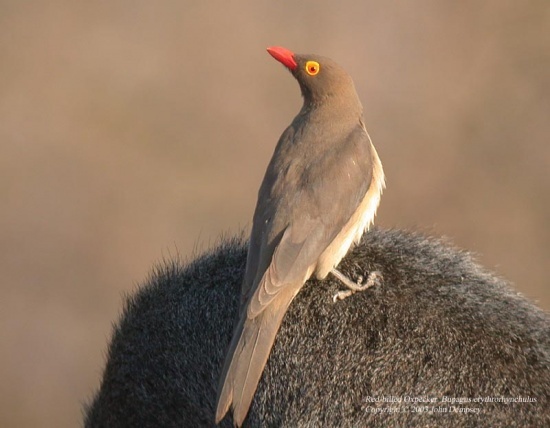 Olivebrown above, tan on rump and breast; red bill and eyes with conspicuous yellow flesh around the eyes. Juveniles have a dark bill and eyes and brown area around the eyes. from western Central African Republic, Sudan, Ethiopia, and Somalia, south in Uganda, Kenya, Tanzania, eastern and southern Zaire to northern and eastern South Africa. Cooperative breeders; courtship often takes place on the backs of host mammals. Breeding occurs at different times in different areas, often associated with beginning of rainy season, and has been reported in all months. Nest of grasses lined with hair and dung is in a natural tree cavity. Clutch size two to five creamy white eggs with brown to lilac speckles; incubation by both parents for 12–13 days; feeding of nestlings is done by parents and helpers; young fledge at about 30 days and are independent about a month later. 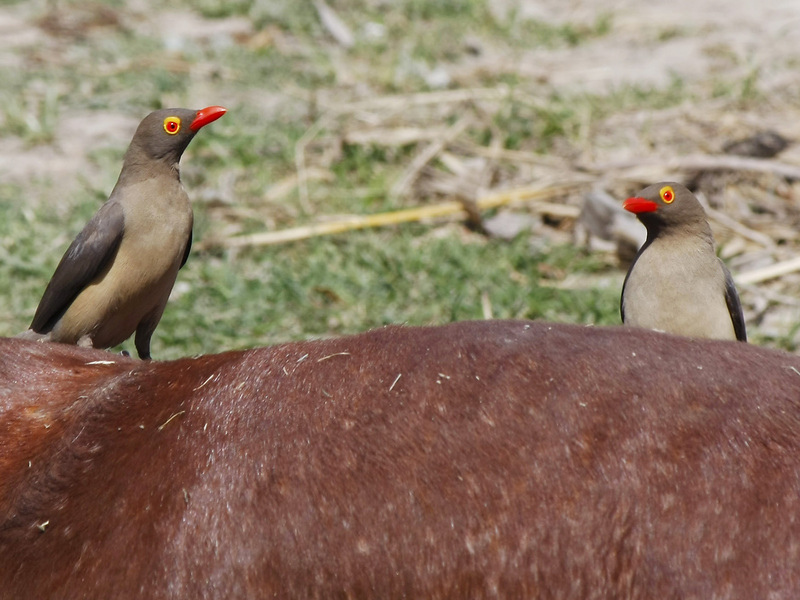 Perform a service for livestock owners, but this has often not been recognized; evidence suggests some negative impacts and oxpecker extermination programs have been carried out in some areas.